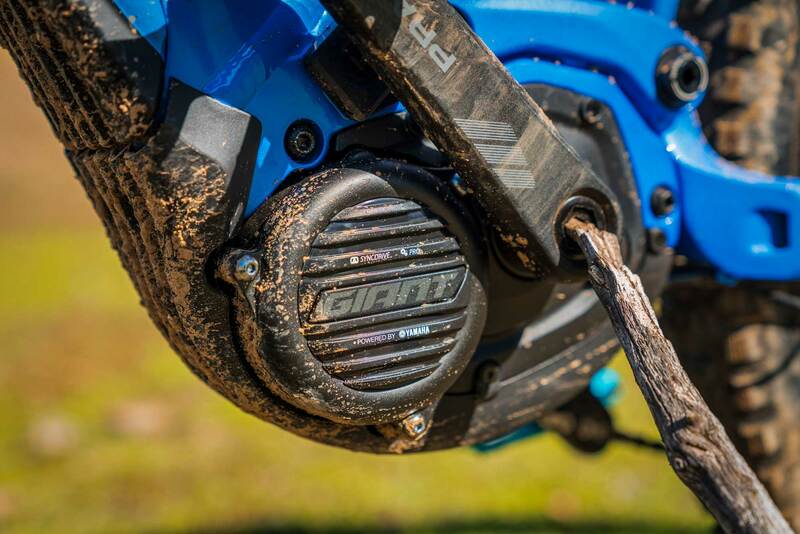 ﻿ Review: Giant Trance E+ SX 0 Pro. Winner of our best descending e-bike award. Our e-bike round up has pitted some of the best bikes of 2019 head to head to determine the winners in several categories. 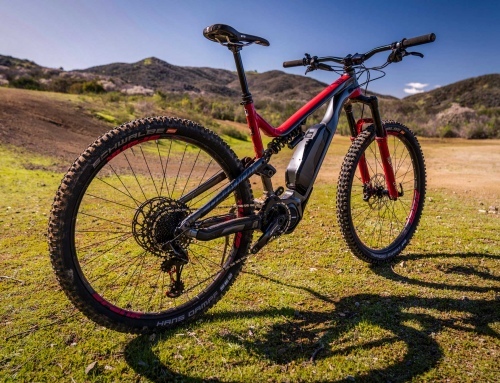 The Giant Trance E+ SX 0 Pro came into the running late, but quickly asserted itself among the competition, ultimately taking the title of best descending e-bike out of our test group. That’s no small title, beating out the likes of the Pivot Shuttle, Specialized Levo and Norco Sight VLT to claim the crown. 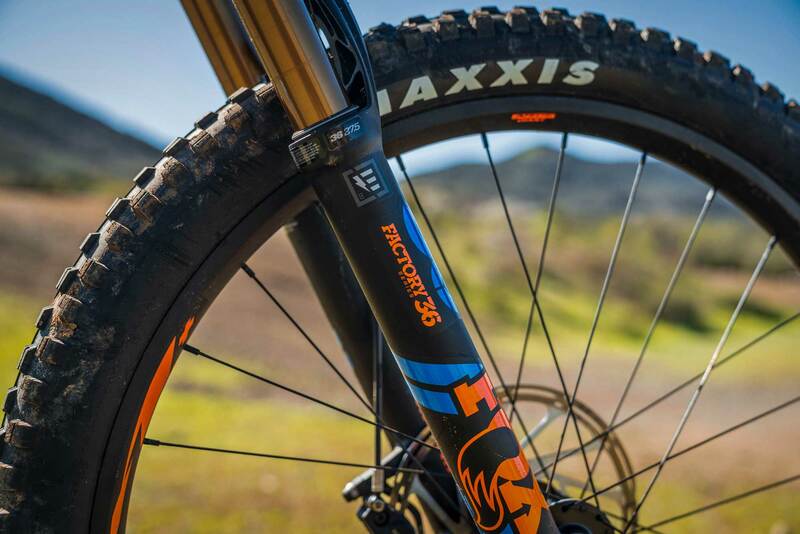 Our test bike is the top of the line model Trance E+, with a coil rear shock and an aggressive build. 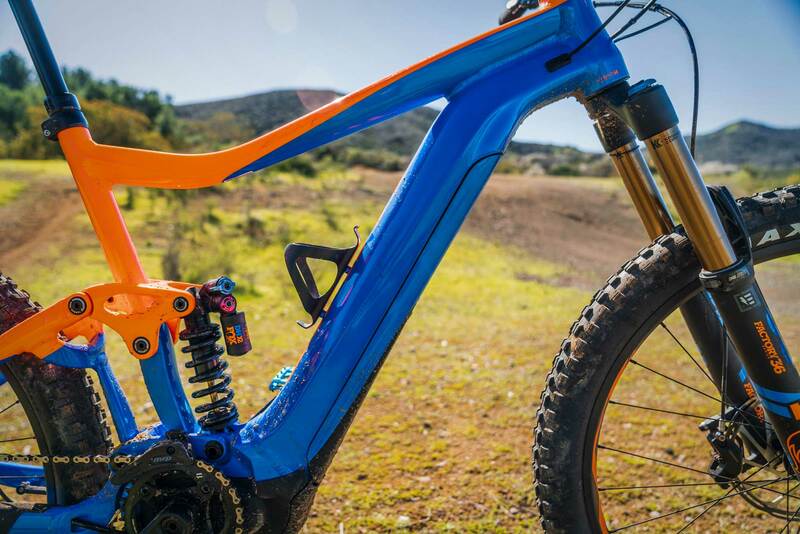 Giant claims it as their hard charging, enduro eMTB, the Trance E+ definitely caters to riders wanting to hit gnarly lines on an e-bike. Built from Giant’s ALUXX SL aluminum, the Trance E+ maintains the familiar silhouette of a Giant, as well as the proven Maestro suspension design. With four pivot points and two linkages, Maestro keeps it simple, but performs. The design is meant to be minimally affected by braking forces, keeping the rear end active under deceleration. Pedal-assistance is provided by a Yamaha SyncDrive Pro motor with custom Giant tuning for more power and response. 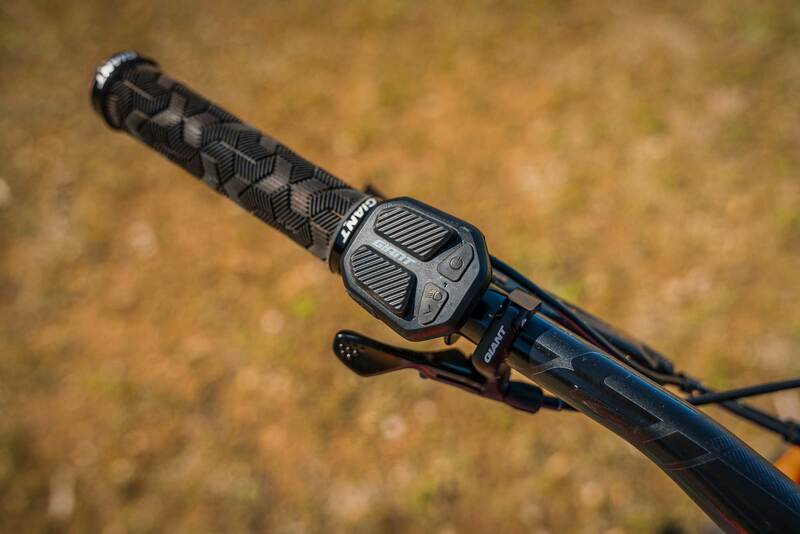 The PedalPlus 4-sensor technology system combines speed and torque sensors with motor and pedal rotation sensors to produce consistent power across the entire gear range. An integrated Lithium Ion, Giant EnergyPak 500, 36V 13.8Ah battery powers the motor but is tucked neatly in the downtube. It’s also easily removable for riders who like to charge their battery off the bike. A RideControl ONE controller with integrated button controls gives a minimalist approach. Though the controller lacks a screen, one can be added and the RideControl ONE can connect with the Giant E-bike app to function as a display. This is the first bike we’ve tested with a Yamaha motor, but we’ll get into our impressions more in the ride section. Out front a 160mm travel Fox 36 Factory, EVOL, Fit4 e-bike specific fork handles impacts. It’s backed by a 140mm travel Fox Factory DHX2 coil shock. The two do an exceptional job of damping chatter and remaining composed. 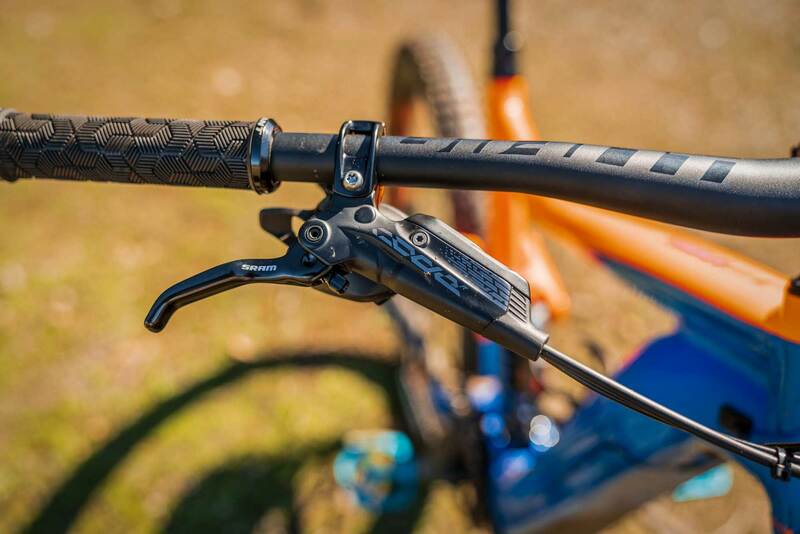 A SRAM XO1 Eagle shifter and derailleur provide the gear range and durability needed on an eMTB. Turning those gears is a 170mm Praxis e-Cadet+ custom forged crankarm set. SRAM Code R brakes do the stopping via 200mm rotors that handle the weight of the bike well. While we expected a third party wheel at this bike’s $7,000 price point, the Giant AM 27.5+, Tubeless ready, 35mm inner width, e-bike optimized wheels did a fantastic job. They were clad in enduro ready Maxxis Minion DHF 27.5×2.6 tires. The seat tube angle on the Trance E+ SX 0 Pro is 74-degrees, with a 66.5 degree head tube and 630mm top tube on the size large frame. Reach on a size large is 459.74mm. 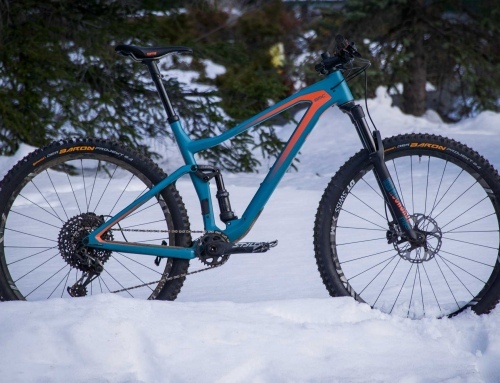 Giant Trance E+ SX 0 Pro quickly became one of the favorite bikes of the test, and was a definite contender for the all around e-bike of the year title. Since the motor is new to us and is probably new to you too, well start our ride impressions there. The Yamaha system has its own proprietary charger port like all the other systems on the market. The overall drive unit is smaller than the Bosch system, but larger than the Brose or Shimano motors. Though the Trance E+ SX 0 Pro lacked a display, we found the Yamaha controller easy to use and very intuitive. A series of white LED lights indicate charge and power level when the power level buttons are pressed. While we thought Bosch’s system was minimalist, the Yamaha controller takes it to a new level. 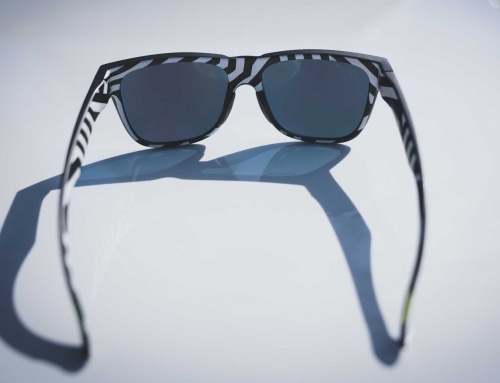 The system was polarizing among testers. I for one enjoyed the lack of a display. Instead of worrying about damaging the unit in a crash or constantly focusing on the range ticking away, I’m able to just ride. However, other testers lamented the lack of data. Their complaints were, “There’s no estimated range, battery percentage, distance, or speed to help us gauge what power mode to use for the return back home.” If you feel like channeling your inner roadie dork and data logging every ride, Giant has a phone app that connects to the system via Bluetooth and will act as a display and track data. The power delivery of the motor was smooth and felt natural, but it is louder than any other system on the market— even Bosch, which is routinely critiqued for its noise levels. Actually we’re not quite sure that it’s louder, so much as the sound is harder to ignore than other motors. Since it’s a deeper note, it’s more noticeable. We didn’t have a decibel meter trail side to confirm. We also had a funny glitch where the motor would attempt to stutter forward when the rider’s foot was rested on the pedals. After reaching out to Giant, it turns out that problem isn’t just on our bike, but on all the Yamaha bikes. That kind of behavior isn’t something we’ve seen happen with the other motors on the market. In theory I can see the issue being fixed with a software update however. Despite a couple critiques with the Yamaha motor, we had no issues taking this bike wherever we wanted to go. It has impressive power, smooth delivery and really wowed our testers. We’re big fans of enduro eMTB’s as they couple all the climbing power you need with the ability to shred down any kind of terrain. Not surprisingly, the coil Fox rear shock and 36 fork made this bike a charger in technical, rocky terrain. While many brands offer bikes that aren’t up to the task on the heinous rocky stuff, the Giant Trance E+ SX 0 Pro was more than capable. The wheel and tire spec also aided in the effort, with stiff support and ample durability. Too man other e-bikes we’ve tested have skimped in this department, and we thought the worst when we saw the in house rims. Thankfully, the Giant wheels hung with the best of them. Out of all the bikes in the test, the Giant Trance E+ SX 0 Pro stood out from the pack with its ability to descend. 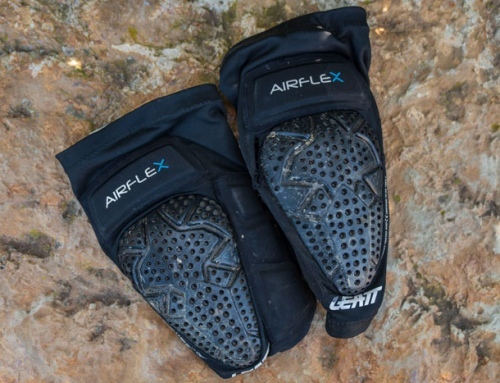 The package is well put together and can withstand the rigors of skilled riders hitting heavy terrain. Composed and confident are two words I can’t help but use to describe this bike’s mannerism on the trail. While it lacked the lively sensitivity and playfulness that the Norco Sight VLT had, this 140mm bike blew away bikes with more travel. No doubt this was largely due to the Maestro suspension, and coil rear shock. 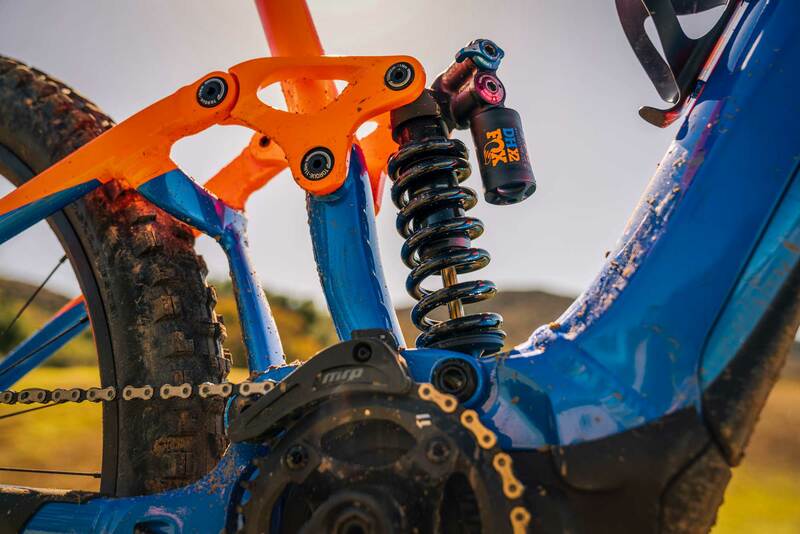 While coil lacks the tuning that an air shock has, the small bump compliance is worth it on an eMTB platform. Even though the numbers suggested that this bike would ride on the more sluggish side, the 470mm chainstays felt much more lively than they did on bikes like the Trek Powerfly LT. That just goes to show that on paper numbers aren’t everything. Put side by side, the Giant Trance E+ SX 0 Pro was far more playful on the trail than the Trek. 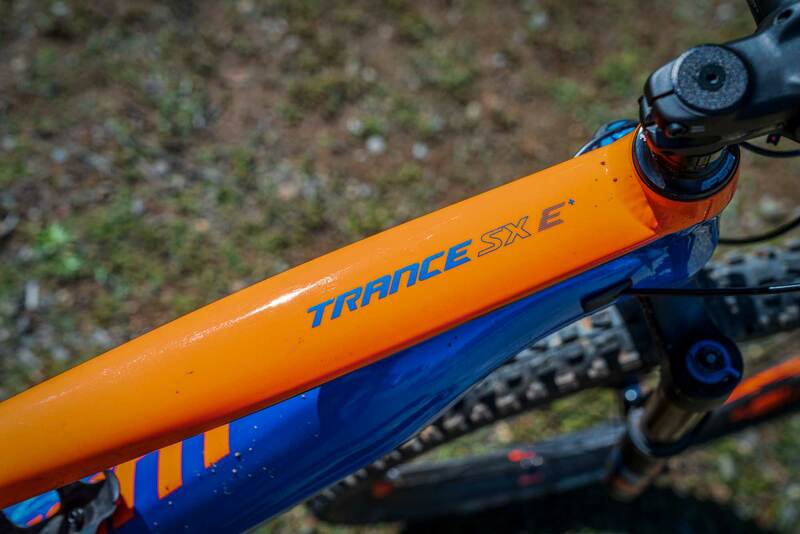 We did however find the stack height to be low on the Giant Trance E+ SX 0 Pro. Even with every spacer we could stack under the stem, the 24.1” (611mm) stack height on our XL left the front end of the bike feeling a little too low to confidently tackle steep terrain. Our solution would probably be swapping to a 170 fork, since it would aid in the bike’s already stellar descending abilities. 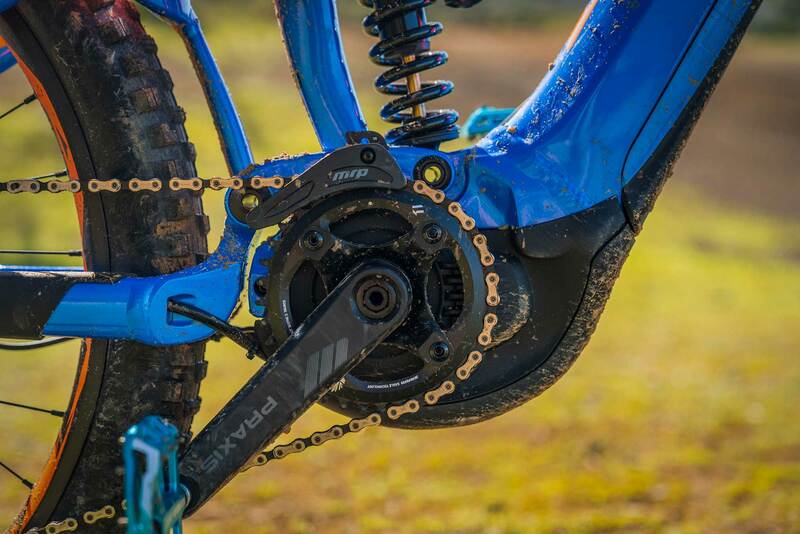 The Giant Trance E+ SX 0 Pro is a bike that impressed us right out of the box. While the color, motor noise and motor controller may be polarizing, the performance wasn’t. This is a bike that will happily take a beating and come back for more. Riders looking for an aggressive eMTB that can handle gnarly mountain bike terrain while still being a capable all around bike will be the ideal candidate for this Giant. We probably wouldn’t push this rig for an all day adventure rider, but for people that want something capable of pushing limits, this is a stellar bike. We’re impressed with Giant’s ability to craft a bike that is so well rounded and put together. We’re excited to see how this bike evolves in the future.